Here is the third and final of a three-part blog post series based on a lecture presented by NGJ Executive Director, Dr Veerle Poupeye, at the Jamaica Music Museum’s Grounation programme of February 16, 2014. Brother Brown’s small, self-built church on Spanish Town Road was decorated with paintings and Brown also produced various ritual objects and musical instruments which were used by his church community, which consisted mainly of his own extended family. 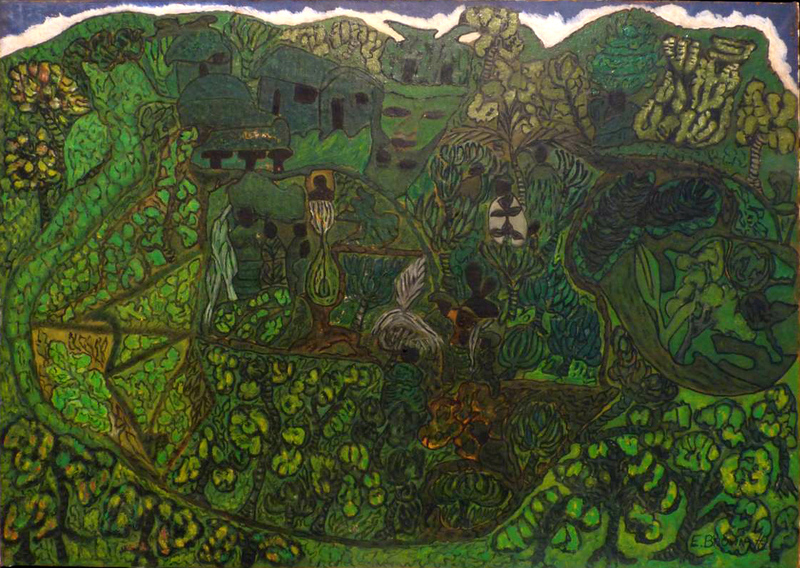 He was discovered as an artist in the late 1960s, by Janet Grant-Woodham, who was Folklore Research Officer at the Institute of Jamaica, and some of the radical young intellectuals at the University of the West Indies, such as Timothy Callender, Edward Kamau Brathwaite and Eleanor Wint, who brokered his first exhibition at the Creative Arts Centre in 1969. 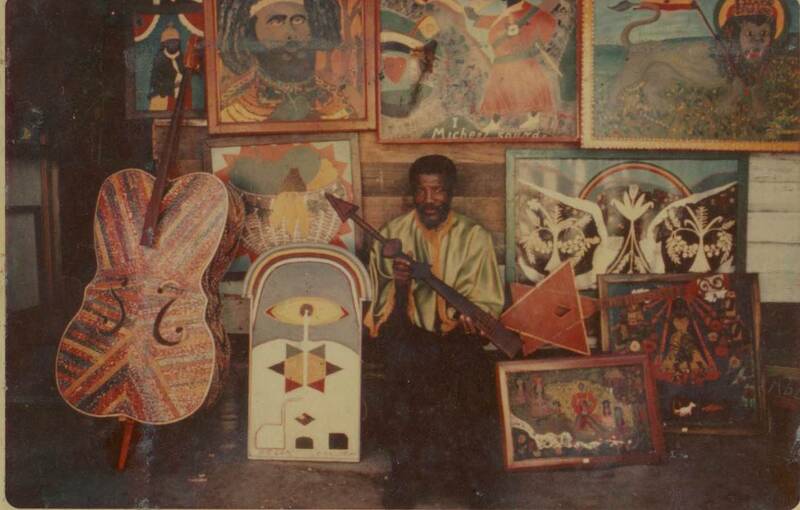 Brother Brown started exhibiting regularly since then, in the 1970s often jointly with his young son Clinton Brown, who also painted and produced musical instruments. We now present the second of a three-part blog post series based on a lecture presented by NGJ Executive Director, Dr Veerle Poupeye, at the Jamaica Music Museum’s Grounation programme of February 16, 2014. But let me now turn to the more specific instance of music and art in Jamaica. Music plays a pivotal role in Jamaican culture and this is predictably and prominently reflected in the country’s visual art. Much of this has to do with the performative character of popular, African-derived religions in Jamaica, which make very active ritual use of music and dance. The three artists who are the focus of this presentation – Kapo, Everald Brown, and Woody – all came from such context. Pioneering research was done by Olive Lewin, Janet Grant-Woodham and others on the music produced by the church communities of Kapo and Everald Brown. Not being a music specialist myself, I have little to add to the research on their music and my focus is instead on the represented and implied music in their work. Everald Brown was also an instrument-maker and his instruments qualify as works of art in their own right, so I am also discussing these in this presentation. Mallica “Kapo” Reynolds was born in 1911 in Byndloss, St Catherine and died in 1989. He received his first vision at age 16 and started preaching in the country side. Like many young rural men and women of his generation, Kapo soon moved to Kingston in search of opportunity and settled in Trench Town, where he established his Zion Revival Church, the St Michael Tabernacle. 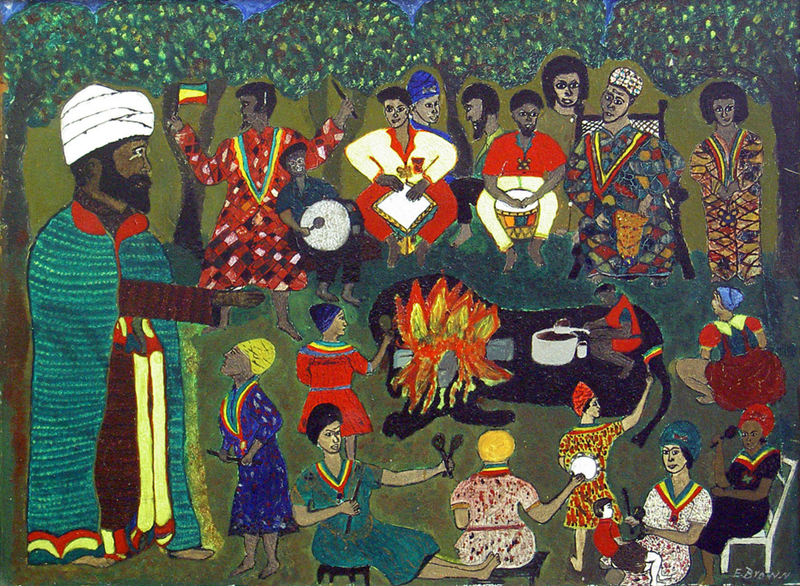 Kapo started painting and sculpting in the 1940s and 50s and rose to local and international prominence as a major artist and cultural icon in the 1960s, aided by the support he received from Edward Seaga and also from others, such as the first Tourism Director John Pringle and the American art impresario Selden Rodman. 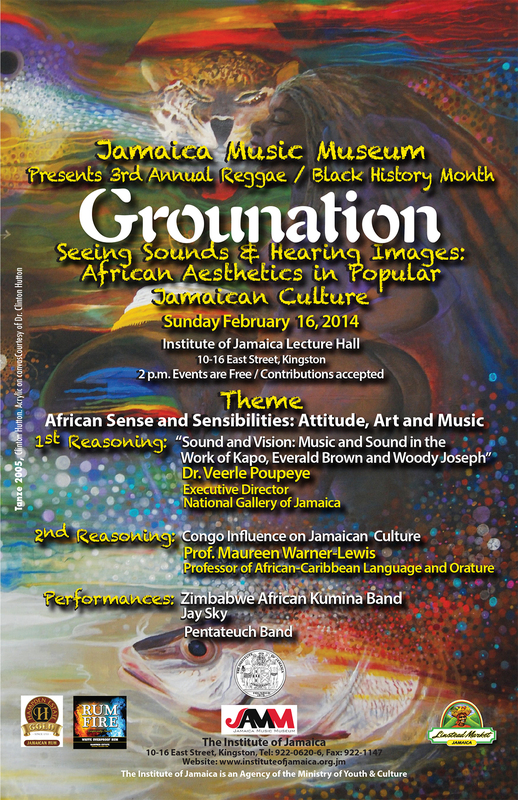 This is the first of a three-part blog post series based on a lecture presented by NGJ Executive Director, Dr Veerle Poupeye, at the Jamaica Music Museum’s Grounation programme of February 16, 2014. 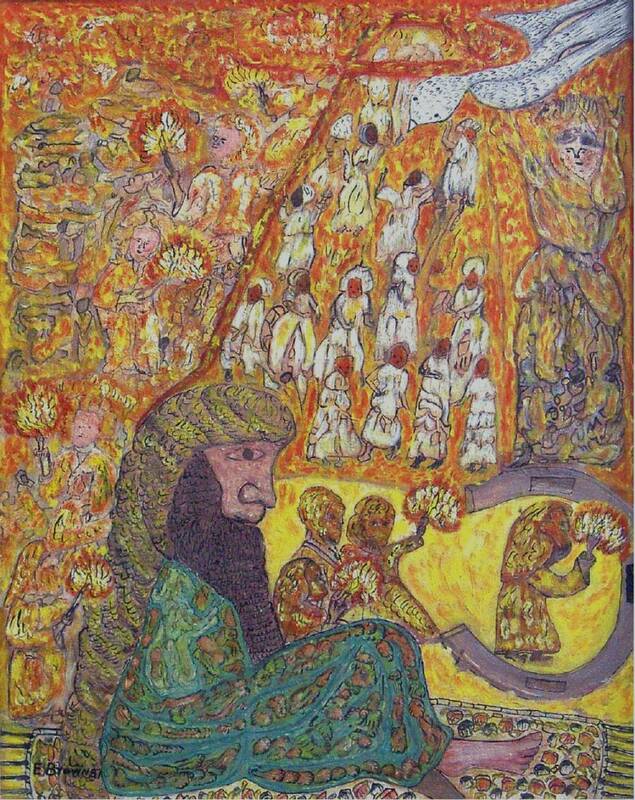 The lecture’s topic is relevant to the current Explorations II: Religion and Spirituality Exhibition, which continues until April 27, 2014. The theme of this year’s Grounation series is “seeing sounds and hearing images” and my presentation invites you to do just that. I will not use sound in my presentation, but I will appeal to your imagination, to “see the sounds” and “hear the images” in the work of three major Jamaican artists: the painter and sculptor Mallica “Kapo” Reynolds, who was a Revival leader; the painter, sculptor and musical instrument-maker Everald Brown, who was a religious Rastafari leader and a pioneer of the Ethiopian Orthodox Church; and the sculptor William “Woody” Joseph, who had no specific religious affiliation but was part of the cultural sphere of Revival. Everald Brown is an artist I have focused on in my original research, writing, and curatorial work since the mid-1980s and I curated his retrospective for the National Gallery in 2004, so he will be my main case study in this presentation.